“How long ago was the first time you were the Guest on our programme?” I asked our Guest, Tiko Siliwea, (above) at the top of the latest edition of our weekly radio show, The Chanters Lodge Experience with the Milli Jam Ingredient featuring Jay Hillz, airing at 20.30 hrs every Sunday night on Zambezi 94.1 fm, Livingstone’s leading local radio station. “About six years’ ago” replied our Guest. These days Tiko is one very busy lady! Apart from being the mother of 5 children ranging in ages from 15 to 3 years old and the wife to her pastor husband Ken Siliwea, she herself is a pastor at the Lion of Judah Church in Livingstone. As if this was not enough, her third album of gospel music is about to be released on CD following on from the success of her first two CD’s. The new album is called ‘Sinilesewa’ (It’s My Time) and we played the hauntingly beautiful lead single ‘Kumisanga’ (‘to find you’) on the show. Tiko told listeners that she had written almost all the tracks on the album herself, and that the CD was due for release during the week ahead. Tiko said that since her last appearance on our show she had obtained a degree in theology from North Western Theological School in USA and had become a pastor at Lion of Judah Church. The church operates from the premises of a former timber company Zambezi Saw Mills, located near the Railway Museum in Livingstone. Congregations vary in size from 250/300 people every Sunday and Tiko is mostly involved with the music and singing at church but also preaches from time to time – of course she has duties in counseling and other responsibilities of the ‘pastor’s wife’ too! She does also have a business specializing in wedding planning and gives singing lessons as well! Busy lady, as I said! The music on the show was standard. We opened with our new theme TINA from Fuse ODG. We featured smash hits from Mark Ronson ft Bruno Mars, and Philip George. We played Kiesza’s No Enemies back to back with Tiko’s track and also featured titles from Alicia Keys and Kachanana ft Joey B. Our oldie of the week was ‘One Way Or Another’ the 1D version and not the original Blondie record. The prize we give of a dinner for two with drinks at the lodge to the first person to text us the name of the artist on the track was quickly snapped up. My pick of the week was Ellie Goulding’s ‘Love Me Like You Do’ the first track released from the soundtrack of the much anticipated movie ’50 Shades Of Grey’. Tiko told us that she had been brought up on the Copperbelt mostly by her dad, and had attended Fatima Girls Secondary School. She had originally come to Livingstone for a job with a now defunct company, before meeting Ken, then a manager with Indeco Estates and the rest is history, as they say! They had been married for 16 years. Jay gasped at that information! Gospel is her favourite music (naturally) and her favourite artist CC Wynans. Tiko loves swimming and tennis and her most loved tennis star is Serena Williams. She was proud of having sung at the Ngoma Awards ceremony in the past, and in 2013 for the closing ceremony of the United Nations World Tourism Organization general meeting held in Livingstone. Asked where she would like to be and what she would like to be doing 10 years from now, this thoughtful, talented, hard working lady said she would like to be teaching in her own school of music and to be promoting Zambian music and musicians. We wished her well. We were delighted to welcome three generations of the same family as our Guests on the most recent edition of the Chanters Lodge Experience with the Milli Jam Ingredient featuring Jay Hillz. Fran Baker (above left), granny to Ellie Dawes in the centre and Ellie’s dad Kev Dawes on the left! The family, together with Fran’s daughter Leigh and her grandson Archie, were visiting Livingstone, staying at Chanters Lodge, on holiday from UK. It had vaguely rained in Livingstone on the day so we jokingly accused them of having brought their British weather with them, an accusation firmly denied! ‘The Experience’ is our weekly radio show airing every Sunday from 20.30 hrs for an hour on Zambezi 107.7fm, Livingstone’s leading local radio station. Fran told listeners that their visit to Zambia was mainly to see her other daughter Gillian Langmead. 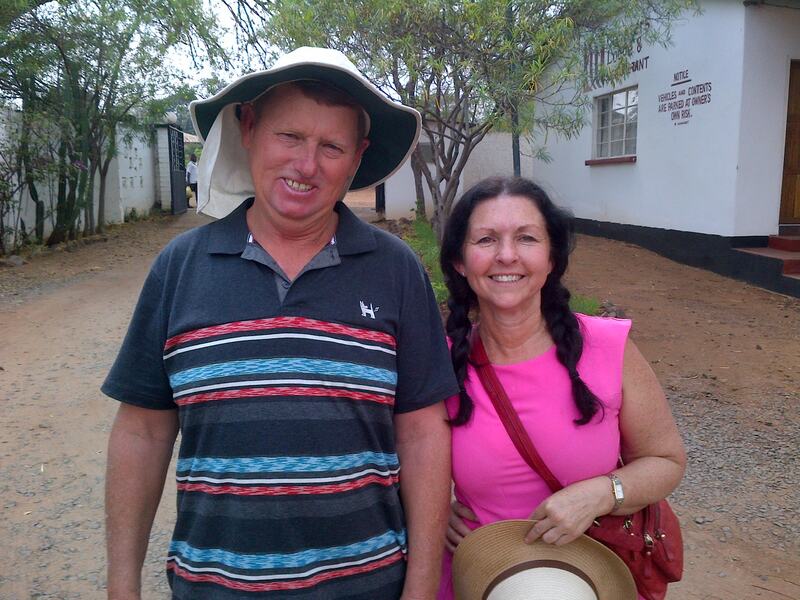 Gillian and husband Peter live in Lusaka and have been guests on our show in the past. Great supporters of Chanters Lodge they are too! Gillian handles the PR and publicity for Proflight and Zambeef, two of Zambia’s most successful companies. Hubby Peter is a great writer and photographer. Kevin told us that his family lives in Dorset in the west of UK and that he is an electronics engineer with Ericssons involved with the installation and maintenance of towers for mobile phone communications. Wife Leigh has her own gardening firm. Fran is retired having worked for many years as a school secretary and for the UK police force. Ellie told us that she’s in Grade 6 at school. The music on the show was good opening as we did with latest tracks from Fuse ODG as well as Waze and Odysssey. The guys chose work from Edma – ‘Remote Control’ a Zambian track where the singer complains that he is used like a remote control by his girl friend, he must do what she says! Ed Sheeran and Chris Brown were other featured international artists. Jay gave us Flexville ft Karasa and Shyman, another Zambian track called ‘Respect’. Our oldie of the week was Ozzy with Making Me High, and the prize we give to the first person to text us with the name of the artist was quickly snapped up. My pick of the week was Gwen Stefani’s Baby Don’t Lie and we closed with All I See by Bondax. The family told us that they had really enjoyed some time on the Lower Zambezi during their visit to Zambia as well as a visit to a crocodile farm. While they were in Livingstone they would of course visit the Falls and were looking forward to touring the Livingstone Museum, Railway Museum and Jewish Museum. They had booked for the sunset cruise before leaving back to Lusaka and on to UK in a few days’ time. Music wise Kevin told us that he likes Jamie Cullum and Ellie’s favourite is George Ezra. Ellie also told us about her dog called Bramble. She said she would like to be a vet when she’s older. Asked where they would like to be and what they would like to be doing in ten years’ time, Fran said she would like to be alive and kicking and still with all her marbles (not sure if MJ and Jay got that one!). Kevin was looking to be fully supported by his grown up children! Meet Bruce Chiboola, Guest on the most recent edition of the Chanters Lodge Experience with the Milli Jam Ingredient featuring Jay Hillz. ‘The Experience’ is our weekly radio show airing live on Zambezi 107.7 fm every Sunday night from 20.30-21.30 hrs and is a lively mixture of local and international music as well as chat with our Guest. We also give a social media update, as well as news of the UK and USA pop charts. Every week we give away a dinner for two with drinks at the lodge to a lucky listener who has been able to text us the name of the artist on our oldie of the week – usually a Zambian track selected by Milli Jam and Jay. On this show we also gave away a CD by Cleo Creations as a bonus! Bruce told listeners that he was born, brought up and educated in Livingstone, completing his secondary education at St Raphael’s School in the city. After school he had joined Thompsons Lodges as a buyer. His passion is tourism and he now has his own consultancy company which, apart from managing Thompsons four lodges, is involved with micro-finance, property management as well as tours and car hire. Thompsons has a total of about 35 rooms and room rates vary from K150-K300 per room per night. (US$25-50). The micro finance side of the business provides short term loans to people in full time employment, underwritten by a firm guarantee from employers. The music on the show was great. Our theme tune for 2014 is Avicii’s ‘Hey Brother’. We played tracks from GRL and The Script. Milli Jam and Jay chose recordings from Kantu ‘Koneki’ (‘pay first if you want a partner!’) As well as Mampi’s ‘Love Recipe’ (‘how to look after your man at home!’) Other tracks were from Sigma featuring Paloma Faith and Jeremih. My pick of the week was Ella Henderson’s latest ‘Yours’. Jay promised to feature the track in the coming week on his daily breakfast show on Zambezi 107.7 fm. Bruce told listeners that he is still single and has a six year old son whom he greeted on air. He is a firm supporter of Manchester United – despite he said ‘their current poor form’! Although passionate about tourism this passion did not apparently stretch as far as doing the bungee jump from the bridge linking Zambia and Zimbabwe at Victoria Falls! He had however bravely tried the gorge swing. We took the chance to tell listeners about the Under The Spray Swim – latest activity at the Falls organized by Bundu Adventures. Music wise Bruce loves Zambian music, particularly Dandy Crazy and JK. Asked where he would like to be and what he would like to be doing ten years’ from now, Bruce said he would like to have an expanded business that was international as well as Zambian. We thanked him for coming on the show and held him up as a great example to young Zambians as to what could be possible for school leavers with hard work and an entrepreneurial spirit!